Time theft describes a situation in which an employee is paid for work they have not done or time they have not worked. This misuse of time can be costly to a business and difficult for employers to monitor. There are three main ways in which employees steal time from their employer: time card or time clock theft, over-extended breaks, and excessive personal time. First, time card theft occurs when an employee either lies about the hours they worked in a shift or has a colleague punch in and out of work on their behalf. Time theft also occurs when an employee takes more than their allotted break time or more breaks than they are entitled to. Fortunately for employers, these types of abuse of company time are becoming easier to monitor and prevent with improved time clock technologies that use fingerprint or retinal scans. On the other hand, excessive personal time on the company’s watch remains difficult to both monitor and prosecute. Excessive personal time includes making and taking personal calls and emails during work hours. In recent years, employees’ personal Internet use has become a particular challenge for many employers to address. In this case Franklin Andrews, an employee of 27 years at the Department of Citizenship and Immigration, was dismissed for cause after it was discovered that he had been spending more than half of each working day surfing the web for non-work purposes for the last few years. Feeling dismissal was a disproportionate punishment, Andrews filed a grievance against his termination. At trial, Andrews was remorseful and admitted his wrongdoing but argued that dismissal had been an overly severe penalty given his decades-long service, efficient performance of all workplace obligations, and consistently positive performance reviews. The adjudicator, Kate Rogers, ruled in Andrews favour. 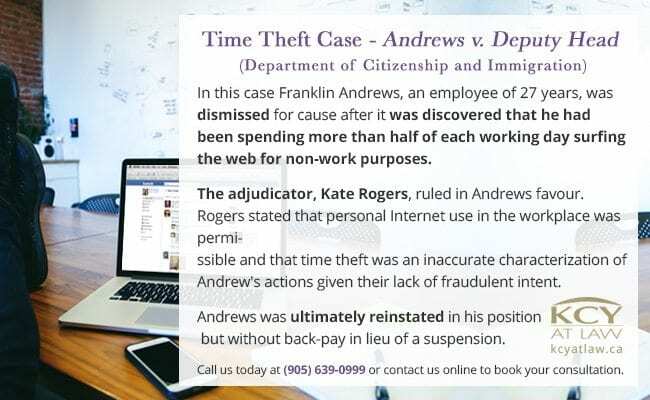 Rogers stated that personal Internet use in the workplace was permissible and that time theft was an inaccurate characterization of Andrew’s actions given their lack of fraudulent intent. Andrews was ultimately reinstated in his position but without back-pay in lieu of a suspension. What then is an employer to do if they want to discourage personal Internet use on company time? Internet time theft cases are difficult to prosecute and existing case law suggests that employers must have a clear definition of what constitutes unreasonable Internet usage. As an employer, you need to have plain and precise policies detailing your company’s expectations regarding personal Internet use and ensure these policies are clearly communicated to employees. 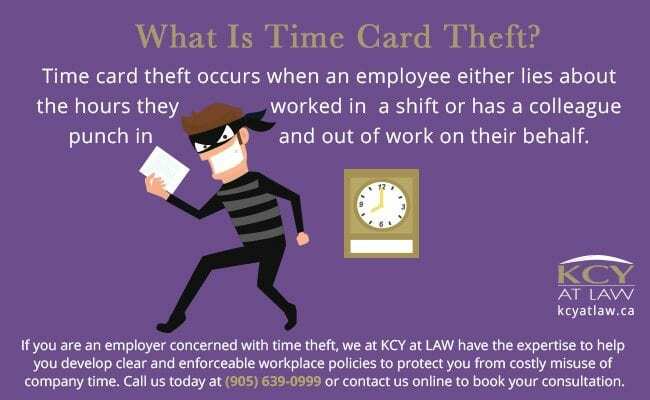 If you are an employer concerned with time theft, we at KCY at LAW have the expertise to help you develop clear and enforceable workplace policies to protect you from costly misuse of company time. Call us today at (905) 639-0999 or reach us online to book your consultation.